Use a gang rig over a single hook when fishing worms. Worms are a traditional bait used by many anglers to catch trout, bluegill and bass. Presented in the proper manner, worms prove to be highly effective in many fishing situations. Often a worm is simply wrapped or balled onto a hook. A gang rig presents a worm in a more natural manner to feeding fish and often improves an angler's chances of successfully catching fish. Slide a 1/8 ounce or smaller egg weight onto the end of your fishing line. Place a bead on the line below the weight. Attach a barrel swivel to the end of the line with a uni knot. Moisten the knot before pulling it tight. Trim excess from the free end of the line with scissors. Cut a 10-inch length of monofilament line from a filler spool to use as a leader. Choose 6-pound test as a rule of thumb and increase or decrease the pound test based on fishing conditions. Tie the 10-inch leader to the barrel swivel with a uni knot. Tie the free end of the leader to the eye of a size 8 bait holder hook with a uni knot. Cut a 4-inch length of monofilament line from the filler spool with scissors to use as a gang hook leader. Tie one end of the 4-inch length to the hook tied to the end of the main leader length. 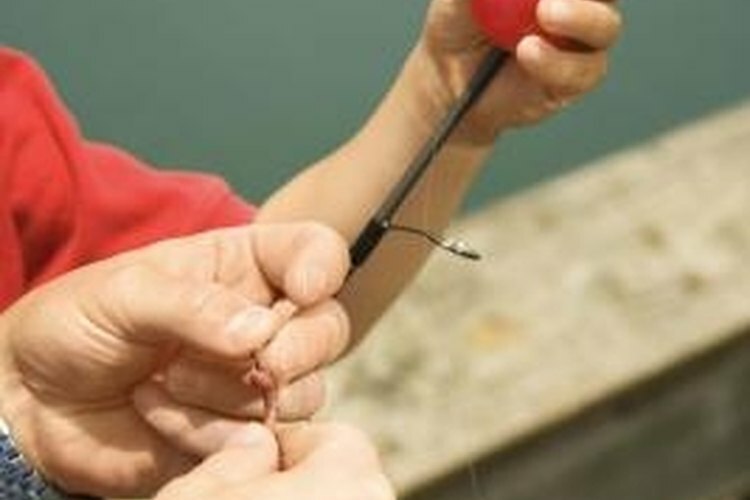 Attach the 4-inch length of line to the bend of the hook with a uni knot. Tie a second size 8 bait holder hook to the free end of the 4-inch leader. Adjust the length of the leader so there is 2 inches of line between the bend of the first hook and the eye of the second hook.